Bring on a heatwave and send in the rainclouds because no amount of sweat, rain or tears is going to shift our makeup after a wee spritz with this little beauty. 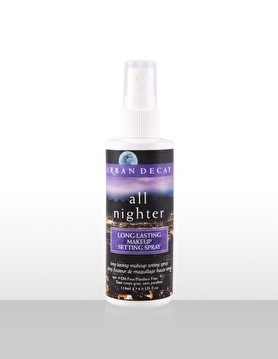 All Nighter is Urban Decays answer to the melting makeup face, whether that may be from over exerting yourself in a club, taking a stroll in a tropical rainstorm or just after a very…very… long day, that make up ain’t going anywhere as it will be firmly fixed to your face with this godsend. The formula comes in a bottle with a spray pump and comes out in a light mist which will cover your face easily in just two pumps. This basically acts as a fixer for all of your immaculately applied makeup and will keep it looking perfect for 16 hours! YES 16 hours…really. This means you could even pop on your makeup before bed have a good nights sleep and wake up ready for work! It is designed to be weightless so your face isn’t left with any dewy looking residue and has intelligent temperature control which keeps your make-up from melting when it is warm and humid or dehydrating when its cold and windy. All Nighter is allergy tested, dermatologist tested, vegan, cruelty free and free of oil and parabens. £17 may seem like quite a high price point but for 118ml and as little as two spritz’s enough to get you through the day, a little goes a long way.